Wide-open green spaces that allow for open-air movie nights, lawn games, yoga sessions and pop-up art shows. A kayak launch on the mangrove canal that leads into Sarasota Bay. Portable food and beverage carts. A scenic Boulevard of the Arts with bay views and “green” parking spaces. 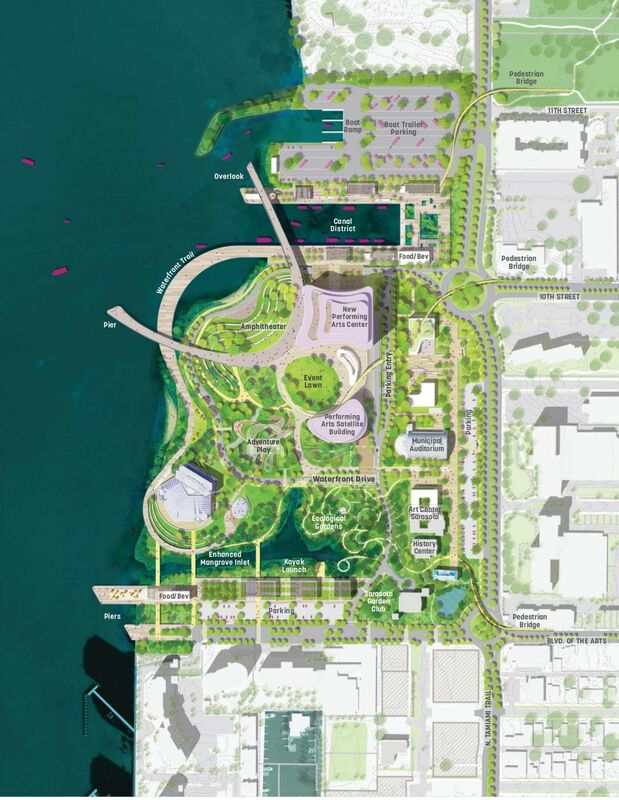 Under design now and expected to be completed in 2020, this linear park is Phase IA of The Bay—the mammoth, 53-acre civic improvement project on Sarasota Bay between Boulevard of the Arts and the 10th Street boat ramps approved by Sarasota city commissioners in September. The Bay at its 10- to 20-year buildout will house a new performing arts complex, an outdoor amphitheater at the water’s edge, a children’s adventure park and more. Two-thirds of the acreage currently is devoted to a parking lot for the Van Wezel Performing Arts Hall; when completed, there will be two-thirds green space, says Gina Ford, team leader for Sasaki, the Boston-based planning and development team that has worked with local leaders on schematics for The Bay for the past year. Ford and her Sasaki team, along with the Sarasota Bay Planning Organization, started immediately with Phase IA to give residents and visitors a tangible example of how the entire project can build community. They estimate Phase 1A will cost between $4 million and $8 million, primarily funded through philanthropic donations. Then comes the rest of Phase 1: a recreational pier jutting into Sarasota Bay, with picnic tables and places to fish (it’s where the G.WIZ building now stands), a roundabout at Boulevard of the Arts and Tamiami Trail with a pedestrian overpass and foot bridges across the mangrove canal linking the linear park to the Van Wezel. Those more ambitious elements will require Florida Department of Transportation permitting and financing, a total investment of $15 million to $25 million, and a five- to seven-year timeline. Sarasota Orchestra’s president Joe McKenna spoke for many at the September city commission meeting when The Bay got the go-ahead. “Not all of us are going to get exactly what we want, but if we all work together we all win,” he said.